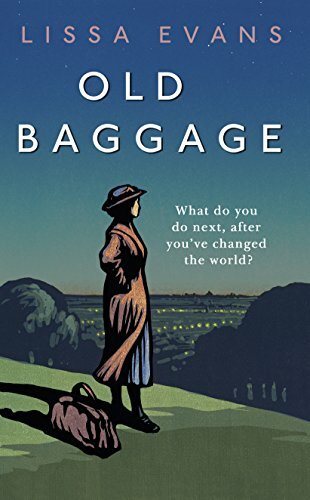 Lissa Evans' novel Crooked Heart is a great favourite of mine, so I was very excited to learn that her new book, Old Baggage, is a prequel to it and centres on the character of Mattie Simpkin, a former suffragette who, in 1928, now finds herself middle-aged and, frankly, rather bored. Mrs Pankhurst's funeral is about to take place and women are finally about to be given the same voting rights as men, but Mattie's left with a strong sense that the struggle isn't over - and she's utterly appalled to learn that a former comrade of hers has recently returned to London to start recruiting teenagers to a newly-established fascist youth league. Mattie takes it upon herself to set up the Amazons, an organisation for teenage girls of every social background that sees them learning self-defence, survival skills and debating on Hampstead Heath, and it's something of a success - until she meets someone with a link to her past, and her newfound sense of purpose becomes dangerously skewed. Mattie herself is every bit as formidable as you'd expect, and yet she's not without her weaknesses. She's single-minded, egotistical and often shamefully unable to see what's under her nose - as her long-suffering friend and lodger The Flea would certainly tell us if Mattie would let her get a word in edgewise. And yet it's impossible not to love her: she's utterly well-meaning even when she's terribly wrong, and there were times when I wanted to drop the book for a moment to applaud her. I also loved Ida, a teenager Mattie and The Flea employ as a maid after Mattie inadvertently injures her by hurling a whisky miniature into a crowd, and The Flea herself, a dedicated and determined health visitor whose own story has an underlying sadness to it that brought me to tears. Every single character in Old Baggage is beautifully drawn; the dialogue is sparkling; the period detail is pitch-perfect. It's often very funny - I laughed out loud more than once - and despite its historical setting, feels timely and relevant. Like Crooked Heart, it has a bittersweet quality to it that means it's deeply touching while remaining solidly unsentimental. I can't fault this book, which has immediately become my favourite read of 2018.